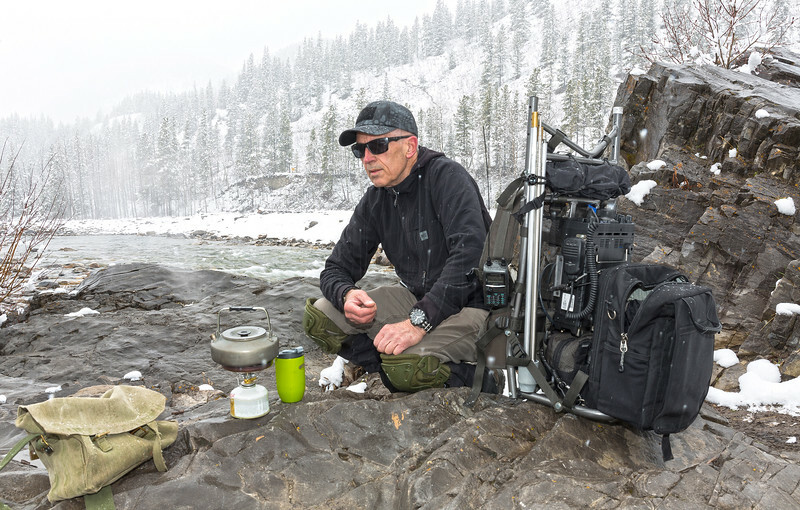 Early morning finds me taking a break in the backcountry of the Rockies, as I wait for the water to boil before brewing a cup of tea. Only in the Rockies, and in all of 20 minutes did the landscape go from no snow to what you see here. I knew better than to get to far from my mobile without packing a rain jacket along, and I soon had it on after shooting this photo with the snow still coming down. The temperature was pleasant enough, hovering around the freezing mark, and after an hour or so, with the temperature having risen a couple of degrees, the snow was a distant memory, allowing me to set up my 10-60 meter vertical antenna as seen stored on the side of my manpack, and make a few contacts. For those of you not that familiar with the Yaesu FT-897ND also part of the manpack as seen here, this transceiver has optional batteries located in the bottom battery tray of the rig, the side facing the camera. The FT-897ND with its ruggedized build is perfect for conditions such as what I experienced on this day. Just so you know, I do have waterproof skins for all the radio gear as pictured if conditions require they go under cover. Also seen in the photo is the Kenwood D72 (VE6AB-7) that was kicking out aprs beacons as required, and although not capable of being heard by a distant digipeater on its own, my mobile (VE6AB-9) parked at the trailhead some distance away, and set up as a fill-in-digipeater, was hearing the D72 and moving the beacons forward to the APRS network, via a distant digipeater or Igate. Only in the southern Alberta Rockies at the end of April do you experience several different seasons all before noon! Whoops, gotta go....the waters boiling!